If you frequently sew with knit or sheer fabrics or you want to produce professional-looking garments, a serger sewing machine can be a lifesaver. These complicated-looking machines use multiple needles and a special cutting mechanism to finish seams, create gathers or pintucks, and perform lots of other helpful tasks. There are many different sergers on the market, but a few stand out as being extremely popular with consumers. What Can You Do with a Serger? Create overlock stitches to finish seams on the inside of garments. In past years sergers were luxury sewing items. Only a few home seamstresses had them due to the cost of the machines. Today, however, you can buy an inexpensive model for around $200. SewVacDirect sells several of the top serger models and offers machines in a range of prices. JoAnn Crafts has many serger models available, and you can try them out in your local store. Comfort House has good deals on a limited selection of sergers. Amazon.com sells several sergers, as well as a number of books on using these machines. eBay has a constantly changing selection of new and used sergers, and it can be a good place to get a deal on a professional model. Brother 1034D - The affordability of this serger, which retails for about $200, may account for some of its popularity, but consumers also praise its ease of use. It can use three or four threads to make a variety of decorative finishes, and it comes pre-loaded with 22 different stitches. It even comes with an instructional CD. This model is a good first serger that produces professional results. Bernina 800DL - According to consumer reviews, Bernina sergers are some of the easiest to use. The 800DL is designed for beginners, and it offers two-, three-, or four-thread sewing. There's a simple lever to produce a rolled hem, and several pre-set stitches. Although this model is marketed toward beginners, its price tag of around $1000 may discourage some buyers. Baby Lock Imagine - Baby Lock is one of the most popular serger sewing machine brands, and the Imagine is their most popular model. Although the price tag on this machine, which retails for over $1000, may dissuade casual seamstresses, it gets rave reviews. If you sew professionally this may be the choice for you. It can use two, three, or four threads and sews at a speed of 1500 stitches per minute. It also features a 25-year limited warranty. How often will you be using the serger? If you'll be doing a lot of home sewing or using the serger for professional work, invest in a high quality model with a good warranty. What is your budget? With models ranging from under $200 to over $2000, your budget will be a major factor in determining the best option for you. Limit yourself to sergers within your means. How easy is it to use the serger? Read professional reviews on sites like AllSewingMachineReviews and Consumer Reports to find out which models are most user-friendly. Does the serger come with attachments, and are more attachments available? You'll need special feet for tasks like making pintucks or gathering ruffles. Make sure the machine can accommodate your needs, and figure the cost of attachments into your budget. One of the most common complaints about all models of serger machines is that they are difficult to thread. Because they use several different thread spools they can be intimidating. Many consumers complain that they don't use their sergers at all because they can't figure out how to thread them. Choose a machine with a color-coded threading guide. This will help you keep things straight. Practice threading the machine at least a dozen times before you use it for the first time. This helps your learn the basic process and keeps you from dreading it. Look for a machine that comes with an instructional CD or DVD that includes information about threading. Alternatively, choose a machine with a book or diagram you can keep handy. Try threading the machine a few times before you buy it. 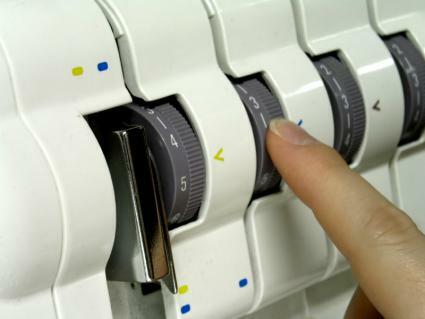 Many stores will let you play around with sergers before you decide on the best model for you. Take a video of someone threading the machine, so you can refer to it later when you need to do it yourself. A serger sewing machine can open up a whole new world of sewing possibilities. Finding the right machine for you involves assessing your needs and budget, examining popular models, and "test driving" sergers you're considering. If you do your homework before you buy, you'll end up with a serger you'll enjoy using for many years to come.